I am faculty at the Department of Political Science, South Asia Institute, Heidelberg University Germany.My most recent research explores the why, how and what of institutional change by examining the evolution of Right to Information Act in India. This research engages with historical institutionalism and theories of institutional change. I am sensitive to both area and history . I have strong faith in field oriented research, some of which is reflected in my field based work on Andhra Pradesh and Bihar.Prior to my academic engagement, I was working in Social Developmental sector in India, where I served as the National Coordinator of a policy think tank called Social Watch. My Doctoral thesis Capturing Institutional Change: Case of Right to Information Act in India was awarded the prestigious Singapore Indian Chamber of Commerce and Industry (SICCI) prize for the best PhD dissertation in 2016 at the National University of Singapore. 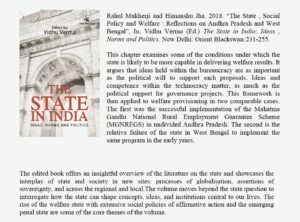 “The State , Social Policy and Welfare : Reflections on Andhra Pradesh and West Bengal”, In. Vidhu Verma (Ed.) The State in India: Ideas , Norms and Politics. New Delhi: Orient Blackswan:231-255.